On 27 October, 2015, the Centre welcomed Susan Buckham (Stirling) to discuss ‘New thinking on Govan Old’. Below is this listener’s brief summary of the lecture. It is well known that Govan Old was an important political centre of the kingdom of Strathclyde from the 9th through the 11th centuries AD. Thirty-one surviving carved stone monuments from the early medieval period are now housed within the church. However, Govan Old also experienced a second period of greatness during the second half of the 19th century, during which time Govan became a centre of shipbuilding and industrialisation. Susan’s conservation management plan focuses on understanding and protecting the post-reformation churchyard. 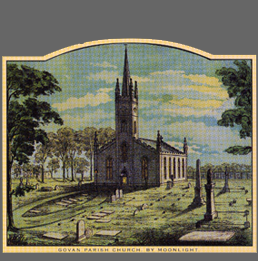 Today, the gravestones present in the churchyard range in date from 1620 to 1890. Susan showed us how she had used lair plans drawn from 1809 onwards in conjunction with historic etchings and additional documentary sources to better understand the transformations that the graveyard has gone through. From these lines of evidence, it is known that several features of the churchyard have disappeared over time. The lair plan from 1809 had shown three entrances to the Govan Old churchyard, including the one which is still used in the south end of the churchyard, one in the northeast corner and one in the southeast corner. Although archaeological investigations have demonstrated that the southeast entrance was likely the earliest, it was eventually blocked off by the stone sheds built to house the early medieval monuments sometime around 1857. The northeast entrance fell into disuse when the manse was abandoned. The elliptical layout of the southern entrance path was not implemented until the early 19th century to contribute to the churchyard’s picturesque image. There is no longer a ‘green road’ encircling the churchyard, many iron railings/lair markers had been removed to benefit the war effort around 1920, and a significant number of gravestones and early medieval monuments were lost during the 1973 demolition of a neighbouring shipyard. 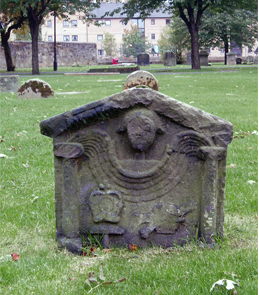 and the reuse of the Govan stones and the later gravestones. Overall, the Govan Old churchyard is a complicated palimpsest which has the potential to contribute to our understanding of post-medieval Govan. The churchyard is a rare oasis of green space that has experienced many changes and transformations throughout its history. By understanding the continuity and changes in the churchyard, we can reconnect the site to the local environment and community and bring about a deeper appreciation of this historic asset. Our seminar series continues on 3 November 2015 with Lizanne Henderson (Glasgow) discussing ‘Fairies, Angels and the Land of the Dead: Robert Kirk’s Lychnobious People‘. This will be held in Room 202, 3 University Gardens at 5.30pm.